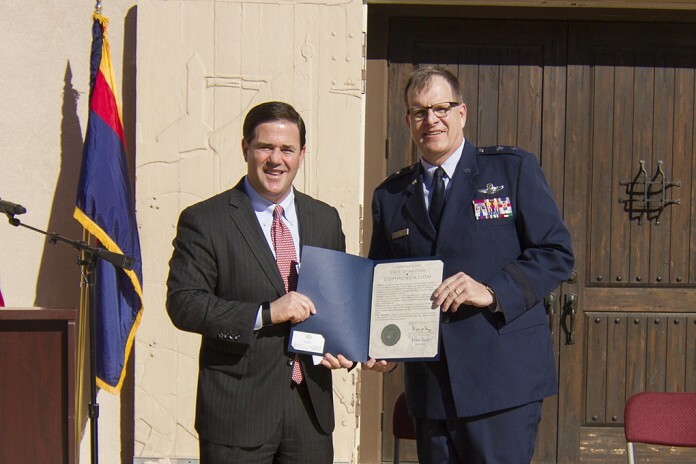 PHOENIX – The Barry M. Goldwater Range celebrated 75 years of air-to-air and air-to-ground training in a ceremony at Papago Park Military Reservation Nov. 10, during which Arizona Governor Doug Ducey provided keynote remarks. The 1.7 million-acre range is roughly the size of New Jersey and with its 57,000 cubic miles of air space, more than 50 aircrews and aircraft can simultaneously operate on the range while performing many independent training missions. More than 76,000 U.S. and international aerial combat training operations are conducted annually on the extensive range. The range provides highly flexible joint military service training and realistic combat replications and is the center point of a semicircular array of military air bases, airspace and ranges that form a highly flexible training complex. The range lies within the unrefueled flight radius of 12 Air Force, Marine Corps, Navy, Army, Air and Army National Guard bases in Arizona and Southern California and is accessible to Navy aircraft carriers in the Pacific Ocean. Nearly 80 percent of all Marine Corps aviation units train on the western portion of the range before deployment. The total economic impact the range has on the state of Arizona is $2.17 billion. Approximately 80 percent of the $95 million in contracts awarded on the range were sub-contracted to local companies.